Questions And Answers for " THE ELEPHANT" which is written by Slawomir Mrozek. " The Elephant " is a great political satire from Poland. The director of the zoo is not responsible for the animals that lived there. To provide an elephant in zoo he decided to make an elephant out of rubber. This creates an ironic situation to point out the absurdities ( अर्थहीनताको अवस्था ) of leftist bureaucracy. Word Meanings And Translation In Nepali Of "The Elephant"
Answers: There is close relationship between the character of the zoo director and the animals he chooses to keep there. He is very selfish person, no doubt. His plan of making rubber elephant is to deceive the visitors. Similarly, the animals that he keeps there to exhibit do not look actually what they are. Giraffe's neck is short; badger does not make burrow; whistler whistles reluctantly. These animals can not give the real impression to the visitor. They deceive people. The elephant, on the other hand, is rubber elephant. The heaviest animal on hand floats easily in the air. This is great irony. As the main aim of zoo director is to deceive the people, the animals he keeps in zoo and his new plan regarding elephant help enhance his aim. Answers: The number of rabbit is three thousand in the zoo. But there is not a single elephant. The elephant is contrasted with the three thousand rabbits. This is very significant because elephant is the most superior animal on earth. It is a fierce and magnificent animal and is very expensive also. Though the number of rabbits is very large, these are many times inferior to the giant elephant. The significance of such a contrast is that even three thousand inferiors can not satisfy the importance or need of a single superior animal, elephant. Answer: The way elephant will be constructed, the material it will be filled with and the way it will be labelled satirize the government bureaucracy in Poland. The elephant is constructed at the advice of zoo director. It is made up of rubber in 'required' size and is carefully painted with correct colour. It is filled with air. Since it is lifeless elephant, it is labelled as a sluggish elephant. There is nothing natural in elephant and it's making process. This manifests the real face of the government that wants to deceive the citizens veiling ( घुम्टो ओढाएर ) them artificially. The polish government favours only the false things and tries to prove them real. Answer: When the writer started to describe the animals in the zoo., I began to suspect that the writer is being ironic rather than serious. Long necked giraffe's neck is short; badger does not make hole and whistler whistles reluctantly. Natural things are twisted ( बङ्ग्याएका ) by the writer. We cannot make giraffe's neck short. Perhaps by twisting the reality the writer wanted to convey something different. When I came to elephant, I was convinced that the writer was becoming very ironic. The writer wanted to reveal the real face of government bureaucracy by showing their deceitful ( छलीपूर्ण ) activities. Answer: The director puts forward his plan for obtaining the elephant in an economic way. The real elephant should be a great burden for the Polish people. So, he suggested to construct a rubber elephant in required size and colour. He also stated that the money saved in that matter could be used in buying a jet plane and conserving the monuments. This proposal is not bad. It is sincerely concerned for the common good. But he remind the officers that he should be rewarded because both his idea and implementation are the modest contribution to the nation. If his idea proved to be a success, he would expect a bonus. Though his proposal seems to be good for common people, it is not free from his desire of self-promotion and self progress. Answer: The school children and their teacher were first to visit the zoo after the arrival of the elephant. The teacher reported the students that the elephant was a herbivorous animal and it pulled out young trees. The students looked at the elephant and waited for it to pull the young trees. But the elephant did not move. Again the teacher described that the elephant was the heaviest animal on land. At the very moment the elephant rose up and disappeared. The students did not believe in elephant and left school to join the hooligans. The rubber elephant is like the political rhetoric and propaganda. In both cases there is no reality. Answer: George Orwell was a great satirist ( व्यङ्ग्यकार ). His "doublespeak" is deliberately ( जानाजानीकन ) difficult and ambiguous. Political rhetoric is also the ambiguous ( अस्पष्ट ) speech in which the speaker says something but its meaning is something different. The politicians distort the reality and present it in different way. Thus, political rhetoric and Orwell's "doublespeak" are almost the same thing. The language of rubber elephant is very tricky which tries to veil ( घुम्टो भित्र छोप्नु ) the reality. So, the "doublespeak" is equivalent in language of the rubber elephant. Answer: I lived at Babarmahal. The road was constructed five years before but after two years it was in very bad condition. The road was so bad that in summer it became dusty and in rainy season ( automn ) it became very muddy. The road was about three kilometer but it was not repaired for last three years. Two months ago the visit of the King to Babarmahal was declared. Then the road department and municipality started to reconstruct the road. The workers worked day and night and the road was completed within one week. The king came and went. But now there are some holes formed again in the road. I think the condition of the road will be the same after two or three months. The king was perhaps impressed with the condition of the road but the reality was quite different to the appearence. Answer: Allegory is a work of art in which a deeper meaning underlies the superficial or literal meaning. We find two levels of meaning in allegory. In political allegory the actions represent certain political event. " The Elephant " story by Morzek, is a political allegory. The story has two meanings. On the surface level, the director of the zoo manages to place the rubber elephant in the zoo. Absence of elephant in zoo was supplied. But in deeper level, he tried to deceive the people by making an artificial elephant. 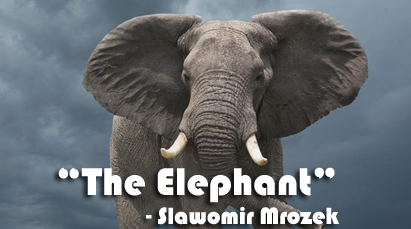 Question and Answers Of "The Elephant"
Class 11 Course "The Elephant"
Important Question Answers Of "The Elephant"
0 Response to "The Elephant [By Slawomir Mrozek] | Questions And Answers"